Trouble, awaiting transport from ACS to Adopt and Shop, will likely not want to go for a ride in the near future, but few cats do anyway. Photo courtesy Long Beach Animal Care Services. Police officers, firefighters and other first-responders are entrusted to save lives, no matter which of them is in danger. Stories of heroism can be uplifting or heart wrenching, but when one of them involves saving a helpless critter, there’s something extra that’s beyond warm and fuzzy. On Thursday, July 12, Sgt. 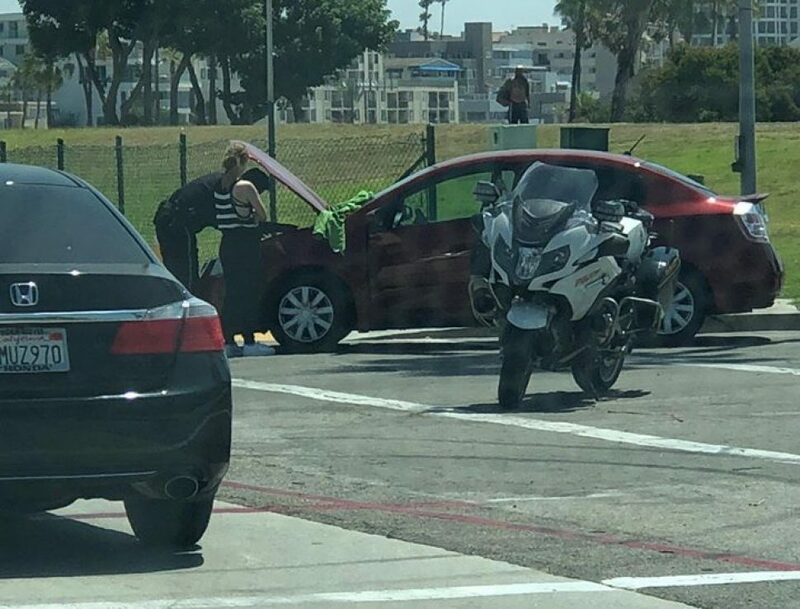 Ernie Kohagura of the Long Beach Police Department was motoring down Shoreline Drive near Linden Avenue when he noticed a vehicle with its hood up and a maintenance truck from the city’s Marine Bureau. He pulled over to see if he could help. The car’s owner, a woman identified only as Candace, told Sgt. Kohagura that she’d heard cat cries while driving, so she pulled over immediately. She discovered a little tabby kitten cowering in the engine compartment. She tried coaxing the kitten out, but the little creature was too frightened. A peek under the hood—Sgt. Ernie Kohagura determines the location of the stowaway kitten as the car’s owner looks on nervously. Photo courtesy the Long Beach Police Department. Kohagura and the maintenance employee tried coaxing her out with a broom handle, but the kitten was having none of it. When it became apparent that she was wedged in the firewall, Kohagura suggested removing some of the engine components so they could nab her. Hot, tired but safe—both Sgt. Kohagura and the rescued kitten could use some air conditioning. Photo courtesy the Long Beach Police Department. 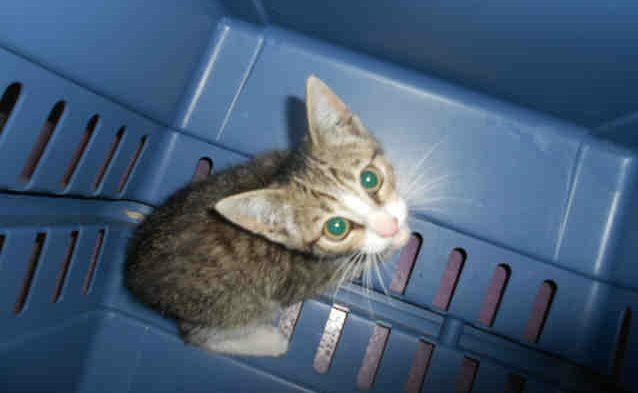 Kohagura named the kitten Trouble and took her to Long Beach Animal Care Services. Trouble cooled off in a kennel for a little while and then was transported to Adopt and Shop in Culver City. Trouble, renamed Olympia despite the suitability of the original name, has been determined to be about one and a half months old, according to Adopt and Shop Manager Lindsey Testerman. 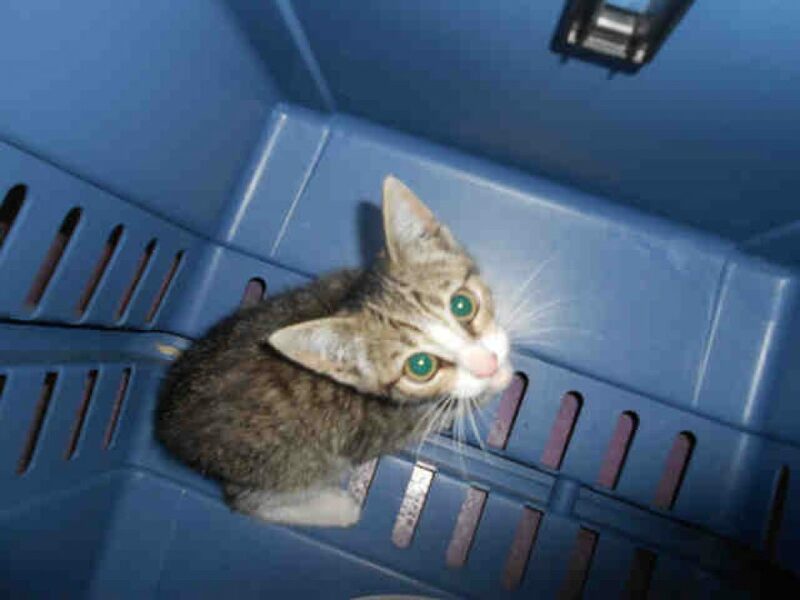 Testerman said that the kitten is now safe and sound with a foster home and will be available for adoption at the end of July (unless the foster falls in love). If you’re interested in adopting Olympia, the kitten formerly known as Trouble, access Adopt and Shop’s adoptable cats page (you might find one you like at least as much, perhaps not with celebrity status but certainly as deserving of a home). As for Sgt. 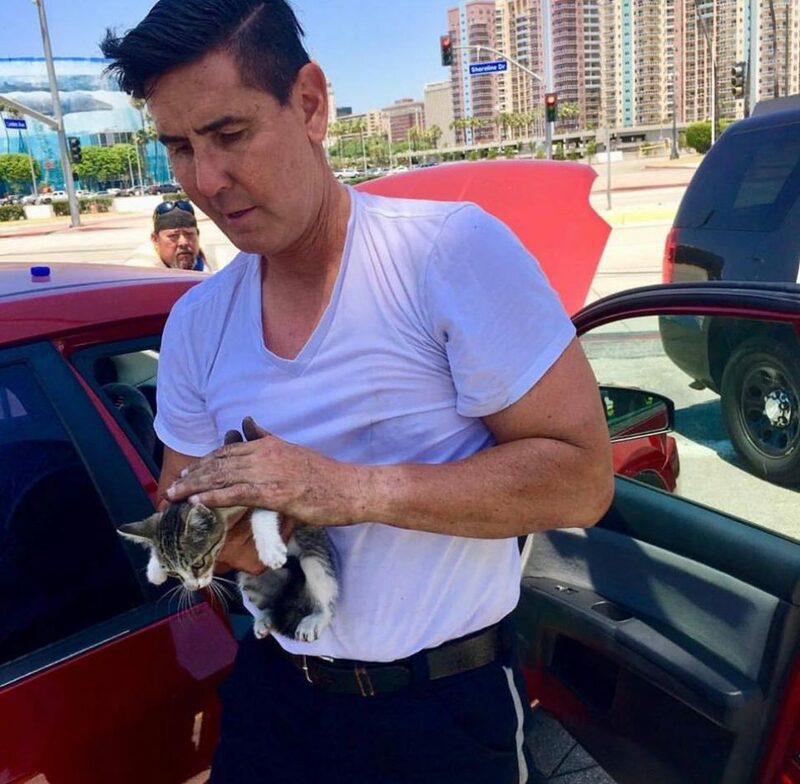 Kohagura, he deserves stripes—tabby ones, of course—for spending two hours in the heat crawling under an equally hot car and taking apart an engine (and likely reassembling it) to save a kitten. His only comment about his searing ordeal?